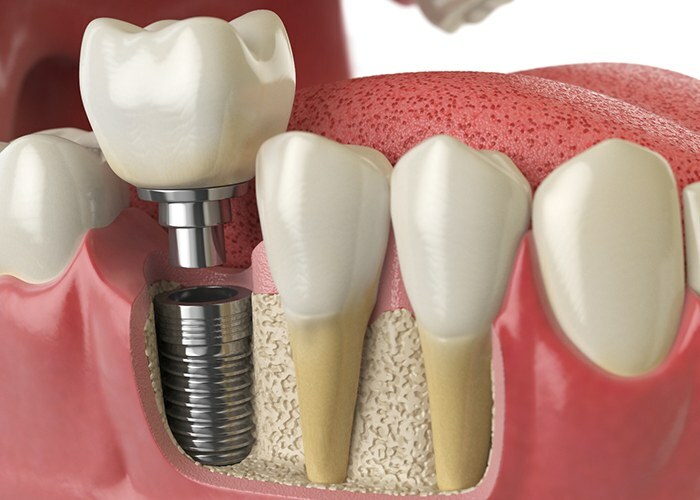 When it comes to replacing missing teeth, nothing does it better than dental implants. 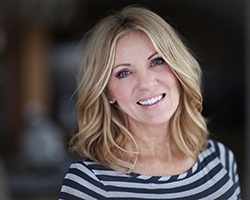 They are the only treatment that restores a tooth both above and below the gum line, delivering the most reliable, durable, and natural-looking results possible. Dr. Castleberry has trained extensively in the field of implant dentistry with both the International College of Oral Implantologists and the prestigious Misch International Implant Institute, making him the local expert that people trust. If you’re missing one, a few, or even all of your teeth, Dr. Castleberry can help you get your complete smile back right here in Houston. To get started, contact us today. 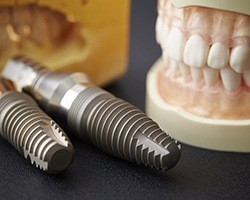 A dental implant is actually a small titanium post that is placed into the jawbone to mimic the root structure of a lost tooth, and once there, it can be attached to any number of restorations that show above the gum line. A minor surgical procedure is needed to place them, which Dr. Castleberry can perform right here in our office. Most dentists have to refer out for this part of the procedure, but thanks to Dr. Castleberry’s education, he’s able to keep our patients’ implant journeys nice and convenient. After the procedure is completed, a patient will be given a few months to heal before they return to our office to receive their new teeth. For a single missing tooth, we can restore it using what is called an implant-retained crown. This consists of an all-porcelain crown connected to the implant using something called an abutment, which is similar to a tiny screw. Once in place, the crown will completely blend into the smile and resemble a natural tooth in every way. For patients missing a few teeth in a row, an implant crown can also be bonded to additional prosthetic teeth to replace them, forming an implant-retained bridge. Sick and tired of your unreliable dentures? 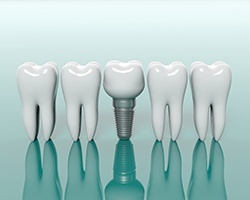 Dental implants can give you a set of teeth you can finally rely on. With implant-retained dentures, the prosthetic teeth are anchored directly to the jawbone using multiple implants placed within the mouth. Compared to a traditional removable denture, implant dentures have a much more secure hold, the fit lasts for years, and it even helps restore more of a patient’s bite strength, enabling them to enjoy a more varied (and healthier) diet. Many patients with missing teeth have experienced bone loss in the jaw as a result, making them ineligible to get traditional implants (implant posts need a strong jawbone to stay in place). 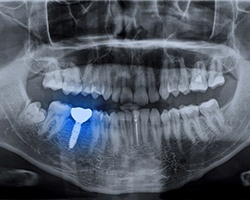 For these patients, mini dental implants now offer a viable alternative. Shorter and thinner than regular ones, they can still be used to secure a denture with a much better fit than a traditional overdenture. They can also be placed in restored in much less time due to their reduced size! With this procedure, we can replace an entire row of missing teeth in just one appointment using only four dental implants. 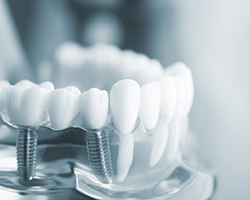 Once the implants are placed, they are immediately attached to a denture. With that, a patient will have a completely new smile! This treatment enables someone to literally wake up one morning with missing teeth and go to bed that night with a full smile. Typically, the only regret people have is that they didn’t come in to see us sooner!